This delightful 3 bedroom semi-detached house is situated in the sought after town of Clare overlooking a green area in a lovely quiet part of town, very close to the Country Park and just a short walk to the wide range of amenities available. Set back from the road, this property offers tastefully presented living accommodation having been updated by the current owner to create a stylish and comfortable home enjoying front and rear gardens with the added benefit of private off street parking and an attractive cart lodge. 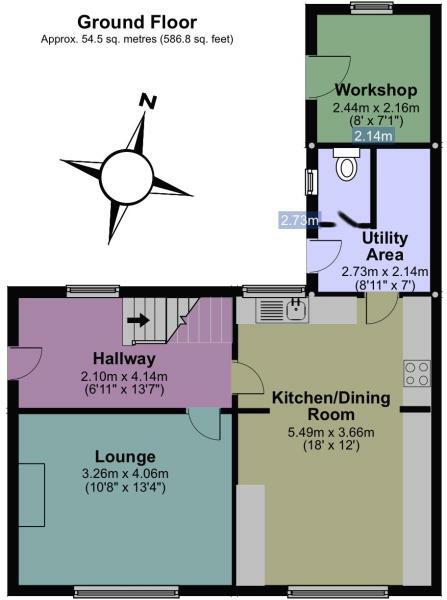 The property offers scope for further extension to the rear, subject to the necessary consents. A particularly spacious and welcoming entrance hall with tiled flooring and stairs rising to the first floor and doors leading to the Sitting Room and Kitchen/Breakfast Room. There is a useful under the stairs cupboard. A cosy room with an open fire place and original surround. Outlook to the front. Single brick area. Plumbing for a washing machine and space for a tumble dryer. Storage area and shelving. Separate doorway leading to a WC. Composite back door leading to the garden, single brick outbuilding and shed. A light and airy spacious area. Access to the loft hatch via a pull down ladder. A spacious double room enjoying a pleasant outlook to the front garden and green. Chimney breast has a fitted double wardrobe with hanging space and shelving to one side, and an alcove to the other side. A good size double room which houses an airing cupboard with storage, the water tank and heating/hot water controls. Also enjoys a pleasant outlook to the front garden and green. 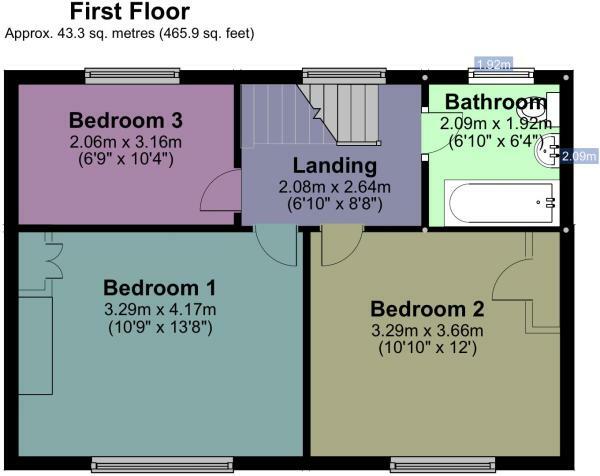 Single bedroom with a fitted wardrobe and outlook to the rear garden. Fitted with a white suite comprising a WC, wash basin, under sink cupboard with a black marbled effect worktop, panelled bath with shower attachment, heated towel rail. Outlook to the rear. The property sits in a lovely position just off the first green in Highfield. A gravelled driveway leads to the cart lodge. A wooden gate leads to the rear garden. The rear gardens are an asset to the property with an attractive raised lawn flanked by a small wall with steps leading up, various mature beds, borders, trees and shrubs.. The garden boasts an extensively gravelled area ideal for summer dining and BBQ's. Freestanding shed. Useful single brick building for storage with a butlers sink plumbed in, light and power connected. This well served and highly regarded small Suffolk market town offers good access to numerous local amenities including schools, shops, cafes and restaurants. The Country Park is very close to the property, only a 2-3 minute walk (comprises of the remains of Clare Castle, a café and walks along the old railway and River Stour) and the town is only a 5-10 minute walk. In town you can find two x doctor surgeries, a newsagent, an art gallery, co-op store, family butcher, antique shops, several hairdressers, a beautician, a very impressive Church, a library, a football pitch and pavilion, a book shop, a seamstress, an architect, an optician, several wonderful café's, an Indian Restaurant, a Chinese Take-Away, a Town Hall, the local Primary School and a very popular Secondary School (Stour Valley Community School). There is also a handy repair garage in Clare, a golf club & café nearby and four public houses (one being a Hotel), with three of them serving food. Sudbury and Haverhill are only a 10-12 minute drive, Bury St Edmunds and Newmarket are both approx.30-35 minutes drive each. Clare is listed in the 50 best rural places to live in the UK. Clare has a real sense of community with dozens of clubs and societies, and there are a number of walks in and around Clare as well as very active weekly walking groups. Disclaimer - Property reference 9525551. The information displayed about this property comprises a property advertisement. Rightmove.co.uk makes no warranty as to the accuracy or completeness of the advertisement or any linked or associated information, and Rightmove has no control over the content. This property advertisement does not constitute property particulars. The information is provided and maintained by Doorsteps.co.uk, National . Please contact the selling agent or developer directly to obtain any information which may be available under the terms of The Energy Performance of Buildings (Certificates and Inspections) (England and Wales) Regulations 2007 or the Home Report if in relation to a residential property in Scotland.